Victor Hampton can he shed his past for his Bengals future? Initial Thoughts: Hampton is a talented player, but after watching the tape I can see why teams passed on him. He had off the field issues and struggles to support the run. When the ball is in the air he is one of the best players that I have watched at competing for the ball. He can let his attitude effect his play. He was benched before a game and then was not active in run support for most of the game. He will need to work on his run support and man coverage. 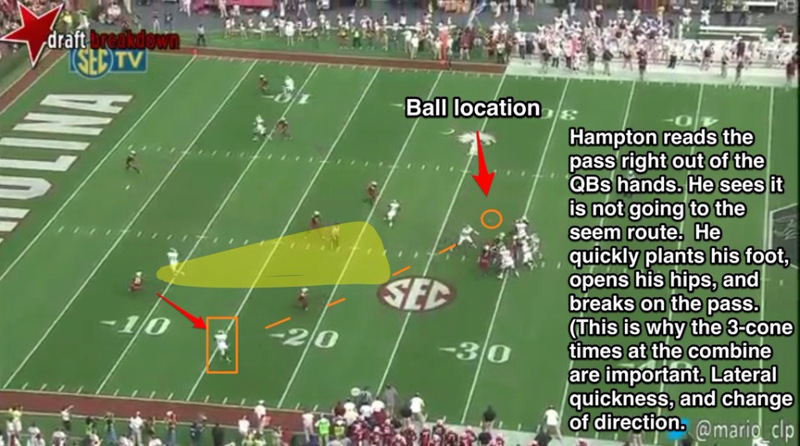 In the slot he will mostly be in on passing plays, where he excels. With the additions of Dennard and Westbrooks this year I only give Hampton a 5% chance to make the 53 man this year. I think the Bengals will want him to prove he can stay out of trouble for a year and stash him on the Practice Squad. I give him a 100% chance to make the PS as long as he stays out of trouble. If he doesn’t clear waivers and a team scoops him up, it’s not really a loss since he was a UDFA. He could take Terence Newman or Adam Jones’ role in 2015 if he is still with the Bengals. Has great instincts and breaks on the ball well. Is exceptional at tracking and contesting balls in the air. Plays well in zone coverage and has good hands for deflecting passes and INTs. Has lots of talent and physical ability. Has experience in the slot and on the outside so he is versatile. Has good quickness and fluidity of his hips; Had one of the fastest 3-cone times. Lacks the size to effectively contribute in run support, and rarely finishes a tackle. 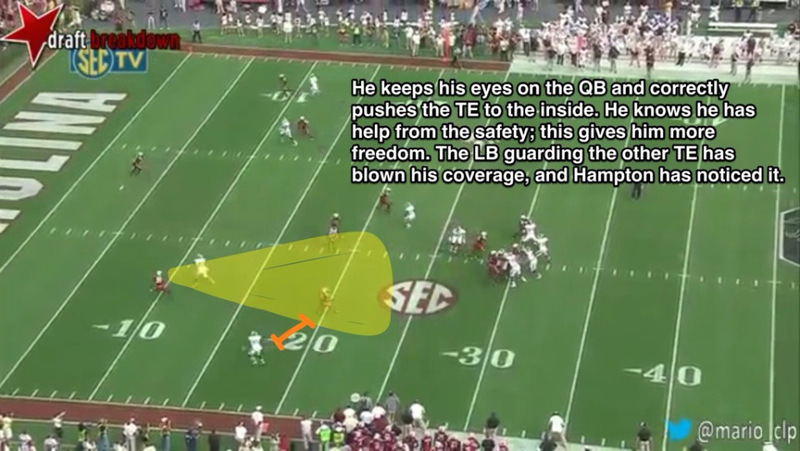 His aggressive approach to going to make tackles causes him to miss a lot of them and take bad angles. He tries to push guys out of bounds or wait for help from his teammates. Character concerns go all the way back to high school with him; he will need to keep himself out of trouble to have a shot. The first sniff of a problem, and he will be sent packing instantly. He is very chirpy on the field; will need to walk the line with this to avoid penalties. 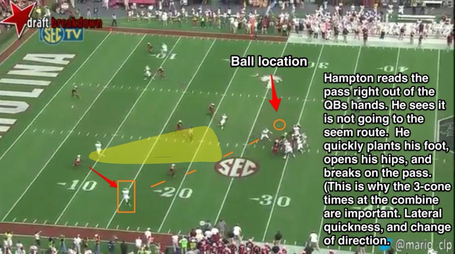 Really needs to work on his man to man coverage, he lacks ideal top end speed. His small stature makes if difficult for him to play bump and run coverage successfully, and can get caught up in blocks. 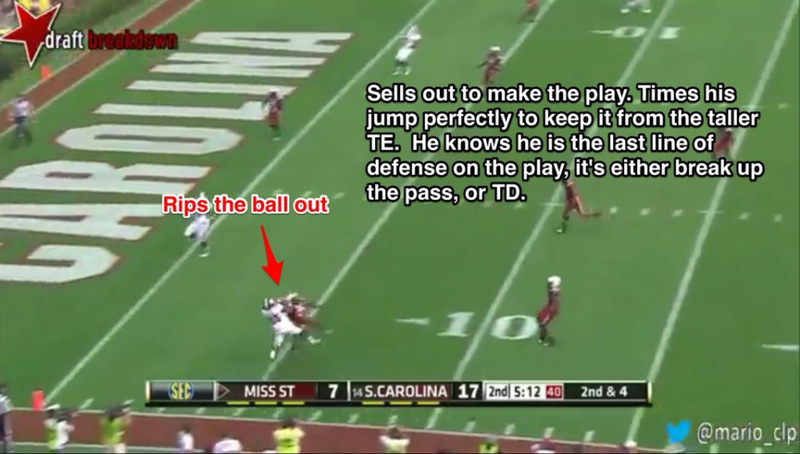 6) He has a chance to stop a big play with an open field tackle, he dives at his feet and whiffs completely. The runner gets an extra 25 yards. 7) He is guarding the blocking WR on the screen play. 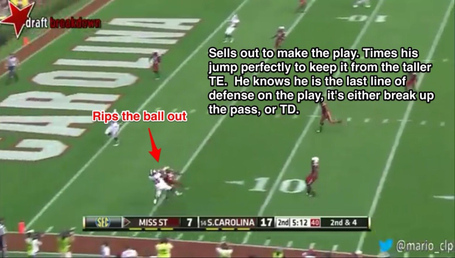 He sheds the block then strips the WR of the ball as he makes the tackle. It shows his great awareness and instinct to go for the knockout blow. 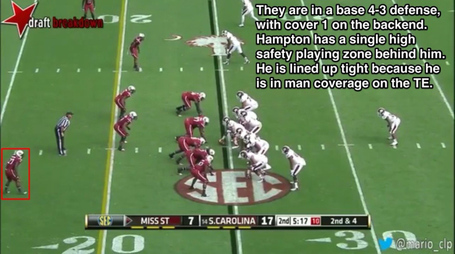 If you just looked at the tape of Hampton, he would have been drafted. It was his off the field antics that cost him hearing his name called. Hampton got some bad advise from his agent. He should have gone back to school for one more year. That would have improved is stock in two ways. He could have stayed out of trouble to build trust with teams, and added more quality game tape. 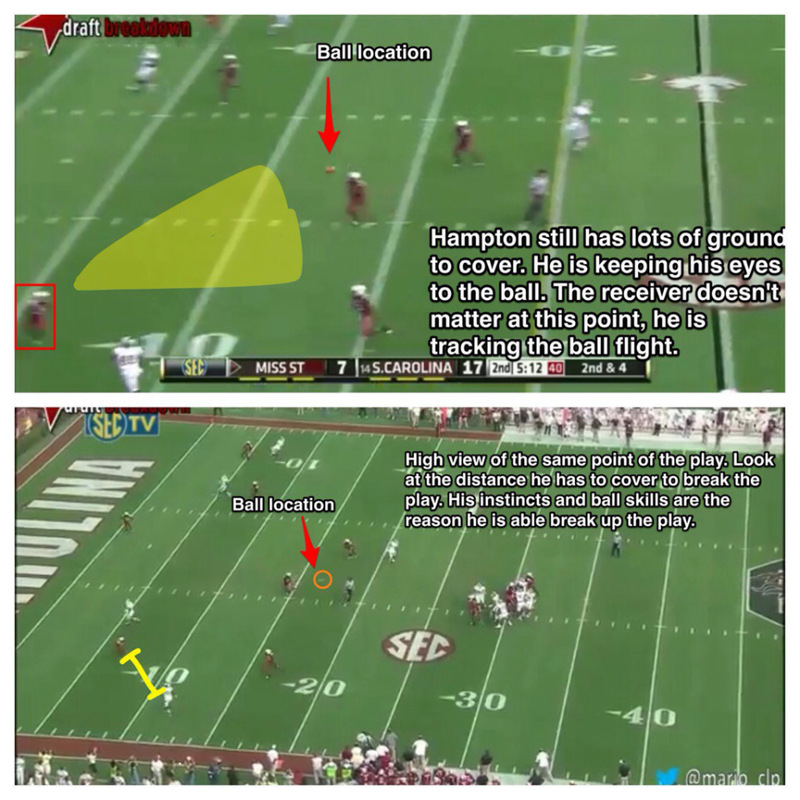 Regardless Hampton is in a good spot with the Bengals. He can get leadership from the likes of Newman, learn how to change his ways from Jones, and how he can dedicate to run support from Hall and Dennard. The problem with the Bengals is that they have five former 1st round picks in front of him. If they only keep five CBs this year, which is very possibly, he has zero shot at the 53-man roster. However, after 2015 one or more of those spots could open up. If he is able to stay on the practice squad (PS) here, that might be the best thing for his NFL career. He can practice and learn from some of the best at the position in the NFL. 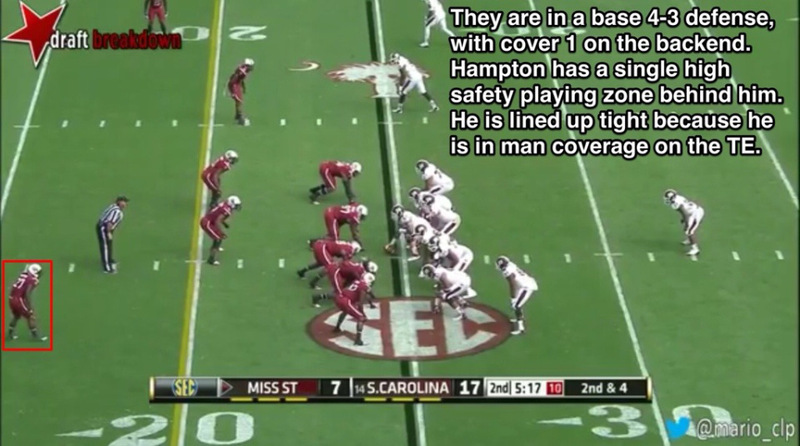 My prediction: Hampton makes it to the final cutdown day and is offered a spot on the PS. I’m not 100% convinced that he will clear waivers. If he makes it to late September and has not gotten in trouble, a team with injuries at the position may claim him. This entry was posted in Bengals, NFL, NFL Draft, Sports and tagged Bengals, Draft, mock draft, NFL, nfl draft, sec, south carolina, UDFA on July 10, 2014 by codiki.